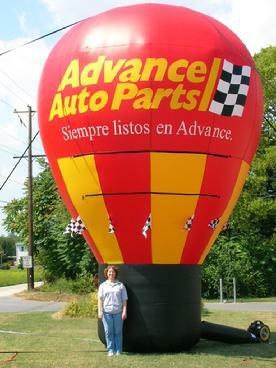 We manufacture GIANT advertising inflatables. Our inflatables are quality sewn, long lasting, cost effective, easy to use and MADE IN THE USA. For over 35 years Sky Signs Balloons has designed and manufactured cold air inflatables for the advertising and display community. Our inflatables are used by Fortune 500 companies, major sports teams, the US government and the pizza place down the street. 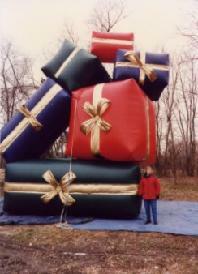 We built our reputation on quality inflatables delivered on time and on budget. This website shows many but not all of our accomplishments. Please don't hesitate to contact us with your needs. If you want to say something to your clients or customers, our HAB (Hot-Air-Balloon) shapes have the largest banner area of any inflatable. Your message can be straight text such as GRAND OPENING, or the most complicated digital art. The balloon's color can be a solid or divided into two or three different colored stripes in many different combinations. Any standard fabric color is no extra cost. We also make different shape HAB balloons. Some people like them fat, some like them slim. Some like them very large, some need just a small inflatable to make their point. The friendliest inflatables are our AirMobile Inflatable Costumes. Both children and adults respond to the costumes and remember them. Most costumed characters interact with customers by shaking hands, distributing coupons, directing traffic flow and welcoming guests. Inflatable Costumes are easy and comfortable to wear and a very reasonable cost. Click here to see more. Air Wiggleys are tubes of fabric that move continuously. The movement grabs your attention. The tubes can be a solid color, stripes, polka dots, or a holiday or patriotic theme. Ann Air Wiggley can have lettering or a logo. Just remember that they are always moving, so details cannot be seen. Air Wiggley Puppets have arms, face and "hair". They can be "dressed" or look like an animal or other character. Air Wiggleys come with a blower that is easy to start, move, and store. So easy even a caveman can do it! HOLIDAY INFLATABLES BRIGHTEN THE SEASON! We have made a wide variety of inflatables for Valentine's Day. Easter, Patriotic Days, Halloween, Thanksgiving and Christmas. And we can make YOUR design. Just email a drawing and tell us how you will use the inflatable and we will give you a quote. Just click here to see more! 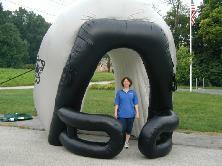 Inflatables catch your eye at sports events, community events and promotions. A run-through helmet, tunnel or other inflatable shape highlights your team. For football the helmet is the preferred shape. You can see teams running through their helmet at all football levels and we have a size to meet your needs and budget. A run-through tunnel with the school mascot logo and sponsor banners, will meet the needs of both boys and girls teams and any outdoor sport. An inflatable giant football, soccer ball, baseball, golf ball, hockey puck, vollleyball or any other type of sport equipment can be set up at community events or used on a flatbed truck for a parade to promote your team and it's sponsors. There are attachment points for banners to promote the event or the event's sponsors. Charging for the banners can help pay for the inflatable and very easily make money for the team. A sports logo is an excellent way to support and promote a team and its sponsors or an event. 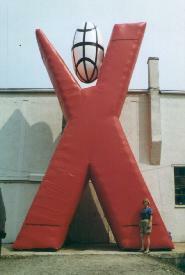 An inflatable logo can also hold a banner to announce the event or the sponsor. 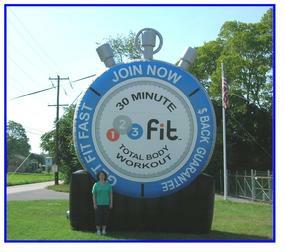 With an inflatable logo you are promoting the team or event every time you use it no matter where it is. For more sports inflatables, click here.